Russkell Furniture are proud and excited to introduce our latest collection of luxury furniture. 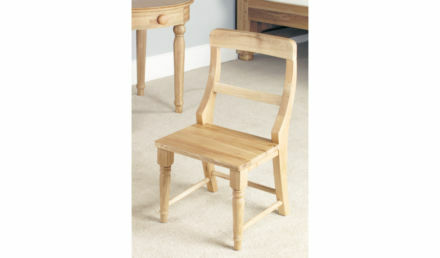 This time, we have focused on the younger generation and now stock a range of quality oak furniture perfectly designed to create the ideal space for young people from babies to teenagers. Our eclectic new range is named Amelie, a pretty name which is derived from the word meaning 'to work'. The collection of Amelie furniture lives up to both the aesthetic and functional values of its name, offering durable, attractive furniture that is guaranteed to provide many years of optimally-comfortable service. Timeless. beautiful and unerringly stylish, Amelie furniture is a prized addition to our collection of luxury home décor and design. The oak is an ubiquitous species of tree; with over 600 varieties (including both evergreen and deciduous) spanning the expanse of the globe from cold to temperate regions, it provides a large amount of timber resources to a diverse multitude of applications. 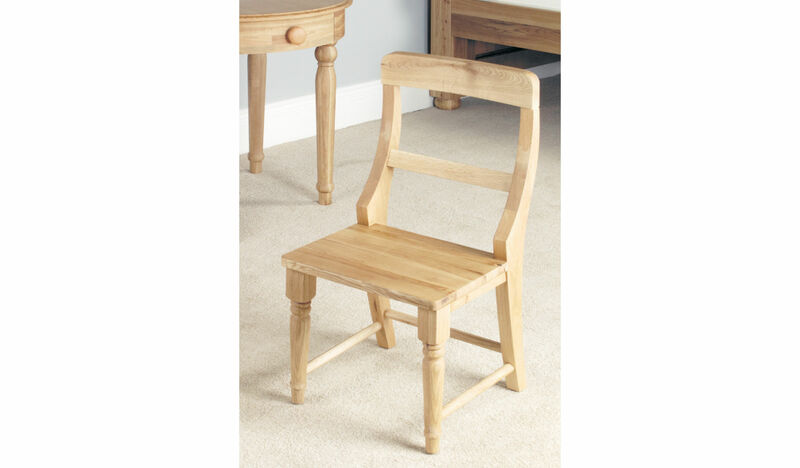 Russkell Furniture select only the best examples of oak to create the Amelie range of children's furniture in order to ensure that the wood's natural qualities of hardness and strength are at their optimal levels. Further enhancing the strength and durability of each piece of Amelie children's furniture is a hard-wearing satin lacquer which, making the wood even more resistant to everyday wear and tear, ensures that the furniture maintains a consistently attractive, new-looking appearance. To ensure sustainability for the future, all of our Oak timber is sourced from expertly-managed plantations, making Amelie furniture an environmentally-conscious choice. 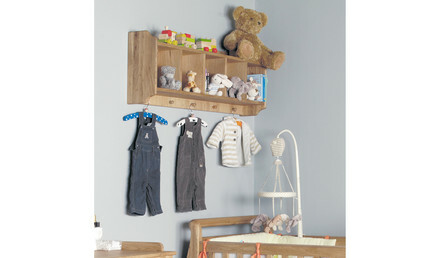 When planning a child's bedroom, the storage of toys and games is often a highly important consideration. 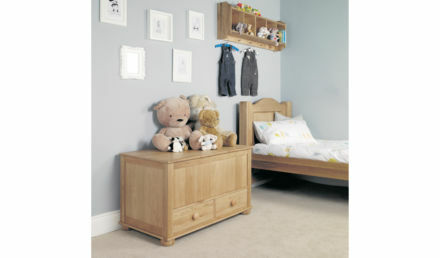 Providing the perfect solution, the Amelie Oak Toy Box from Russkell Furniture offers a large amount of practical storage space whilst maintaining a clean, sleek aesthetic quality. The box features two roomy drawers along with three removable storage boxes and is finished with an innovative 'soft-close' damper which, controlling the closing of the box, will keep children's fingers safe from being trapped. Supplied as a solid, single unit, this toy box requires no assembly and can therefore provide instant service in your child's room upon delivery. A child's first bed should be comfortable, supportive and conducive to good sleep, preparing them for a lifetime of a healthy sleeping habit. 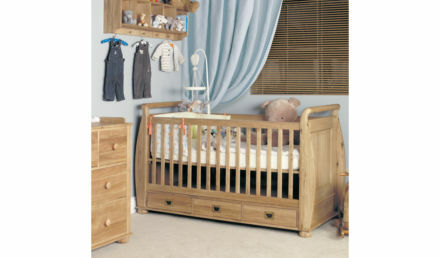 As part of the gorgeous Amelie range, Russkell Furniture have created the Children's Oak Cot Bed to offer a blissful sleeping experience throughout the sleeper's childhood with the extra bonus of drawer storage space. The cot's base is adjustable to three differing heights and the unit can quickly and easily be converted to a day- or sleigh-bed in a matter of seconds. Aesthetic details, such as the solid antique brass drawer handles which are flush mounted, are complemented with functional additions such as the integral teething strips. 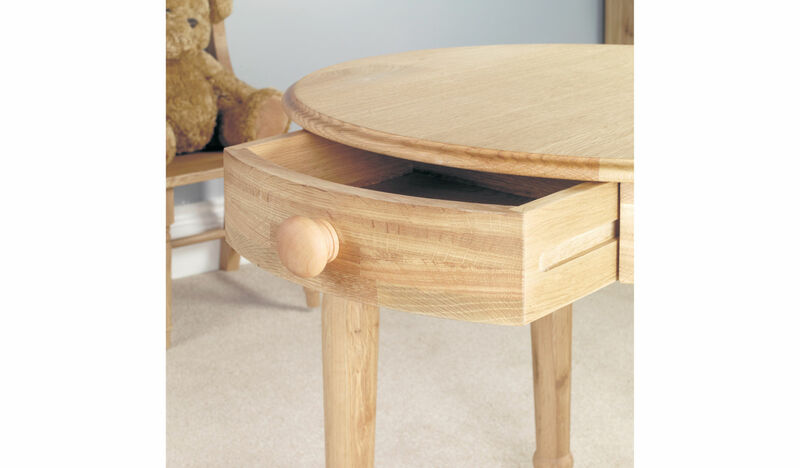 Please enjoy browsing the full range of Amelie Children's Oak Furniture and do not hesitate to contact our team by calling 01254 773232 or emailing info@russkellfurniture.co.uk for further advice, information and support on our extensive range of products and services.